One of the toughest parts of holding a garage sale is deciding how to price everything. You don’t want to put your prices too low, or your profits won’t be worth the time you spent setting up the yard sale, but you don’t want to set them too high either, as no one’s going to buy anything. So if you don’t want to lose money or have tons of yard sale leftovers, you need to price things correctly. And when it comes to pricing garage sale items, there’s a sweet spot that you need to find. Fortunately, we’ve put together some simple tips and easy to implement methods on how to price garage sale items. Yard sales can get hectic, and having to answer the question “how much do you want for this” over and over again can get pretty irritating. A big mistake that many sellers make is not putting a price on their yard sale goods. Customers don’t want to have to ask the seller what the price is for every item that they pick up – having to do that will leave them feeling frustrated, and shy buyers might even leave without asking at all. So follow this simple rule: put a price on everything! If you want to a save a bit of time, then group together items that are all priced the same, place them on one stand and put one big price sign above them. For example, if you’re offloading a ton of DVDs, then put up a sign that says “DVDS $1 each” or “all items on this table $2”. Aside from failing to price items altogether, many sellers also make the mistake of not displaying their prices clearly enough. Shoppers don’t want to have to hunt for the price of an item – it should be easy to find. I’d suggest using colored price tags (you can find them on Amazon or even your local or online Dollar Stores). Use specific colors for specific price points. For example, red tags for $0.50 items, blue tags for $1, and so on. That said, make sure you do put the actual price on each tag so people don’t get confused. Using colored price tags makes it easier for you and the buyers to know how much each item costs with a quick glance. And to make it even easier, I would create a kind of price guide on a cardboard box. Put the price tags on the top or the front of each item. As mentioned above, if you’ve got a group of items that are all priced the same, then hang a big sign above them indicating the price for every item. Knowing how to price garage sale items can be tough. How exactly do you decide on a specific number for an item? You don’t want to go too high, or you’ll discourage potential buyers, but go too low and you won’t get the prices you want for your goods. It can be hard to know how to price stuff. Price items at one-third or one-quarter of the price they would cost new. For example, if you have a coffee table that cost $100, then sell it for $30 to $40. This rule is just a guideline and it might not work for every item, but it’s a great starting point. Let’s say a customer is interested in an item you’ve priced at $100, but they want to haggle on the price, so they offer you $95 for it. If $100 is the lowest amount you’re willing to take for it, then it was a mistake to put a $100 tag on it. Instead, put $105. When you’re pricing your items, always keep this is mind: you can always reduce your price, but you can’t go back up. Think about the lowest number you’re willing to except on each and every item you plan to sell, and then price each item a few dollars higher than this amount. Then, when a bargain-hunting shopper comes by looking to haggle on a piece, you have room to reduce the cost, without going below the figure you wanted for it. This way, the customer feels like they’ve got a bargain, but you still get the amount you wanted to sell the item for. Another way to price garage sale merchandise is to offer bulk buy deals. So, for example, let’s say you have some books to sell. You might price them at $2 each, but you could also offer to sell six for $10, so the customer saves $2 if they buy in bulk. This type of offer can really entice customers into making a purchase. People love feeling like they’re getting a good deal and a little more for their dollar. If you have a lot of one particular type of item, then consider offering a bulk buy deal. When you’re pricing items, you should always look at your stuff objectively, as difficult as that can be. Is someone really going to pay top dollar for a 15-year-old bookcase or be knocking down your door to buy old, stained clothing? Similarly, while pricing items at a third or a quarter of what they cost new is a great rule of thumb, it doesn’t work for everything. For example, just because you paid $100 for a sculpture ten years ago, it doesn’t mean that someone else is going to pay you even a third or a quarter of that price now. Pricing items based on sentiment is a really bad idea too. Just because an item holds treasured memories for you, a customer won’t care or be willing to pay more to purchase it. Ask yourself how much other people would realistically be willing to pay for each item, before you set a price on anything. If you do have a lot of items that are stained, broken or have little value, then consider setting up a freebie table and putting them on there. Customers love good deals, and a freebie box can be an effective marketing tool. Customers that take from the freebie table are very likely to look for other items to buy alongside it. If you’re struggling to price your merchandise, then visit a few yard sales in your local area. This can give you a better idea of what other people are charging for similar stuff. For example, you might see DVDs on sale for $2 each, when you planned to sell them for $5 and realize that your original price was too high. Or you might see name brand clothing sells for $5 apiece when you only planned to price yours at $2 each, and realize that your price is too low. If you’re selling a big item, like a bookcase or a sofa, then you can’t expect customers to search all over it to find the comparatively tiny price sticker. So don’t use the same price stickers to mark small items, like books, and big stuff like furniture. Instead, create a big sign. You can use poster board or even just a big sheet of paper, and put the price in big lettering – you can even list a few of the item’s best selling points. The bigger the item, the bigger the price sign should be. You want to make it as easy as possible for your potential customers to find the price of each item – don’t make them work for it! Using the rule of third/quarter, pricing items for a few dollars more, and checking out what other sellers are charging at yard sales are all great ways to figure out prices for your stuff. However, when it comes to items that might be valuable, such as collectibles or antiques, doing your research is really important. Take a look online to see if there’s a similar or the same item listed, take note of its price and consider selling it for that amount. If it’s a particularly valuable item, and you want to get a good deal on it, then you might be better off selling it elsewhere, as you might not get the price you want at a garage sale. Selling used clothes, especially if they’re not name-brand, can be pretty tough – with the exception of maternity and baby/kids clothes. That’s why you have to be willing to price them a bit lower than you would other items. After all, if a person is on the fence about buying a piece of clothing, they’re more willing to make the decision to part with their cash if they only have to shell out one dollar, rather than five. That said, most yard sale items fall into a dozen or so major categories. Again, these are not set in stone. Use this as a guide, not a hard-and-fast rule book. Holding a garage sale is a great way to declutter your home, and make a bit of a profit out of your old stuff. One of the most daunting prospects for sellers, however, is simply pricing their goods. 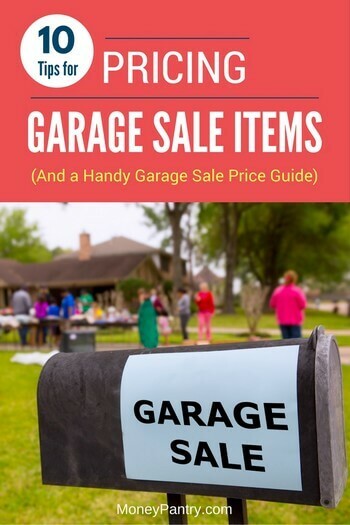 Fortunately, with these tips and methods, knowing how to price garage sale items is much easier! 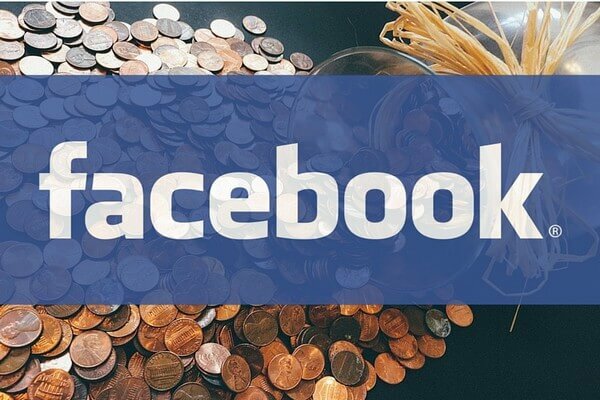 7 Ways Facebook Helps Its Users Save Money: Are You One of ’em?